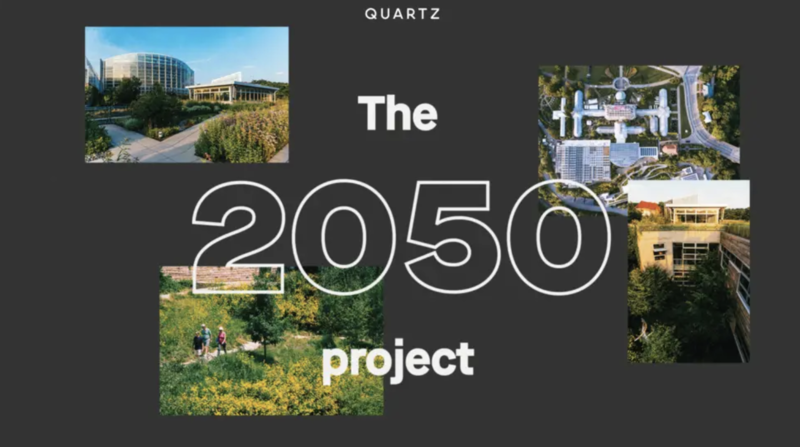 Steven King, assistant professor with the Center for Innovation and Sustainability in Local Media, based in the UNC School of Media and Journalism, developed 3D modeling of a well-known Raleigh building for Quartz’s 2050 Project. King, who teaches interactive and multimedia at the MJ-school, modeled the James B. Hunt Jr. Library for the 2050 Project, which examines innovative urban architecture around the world. By 2050, two-thirds of the world’s population is expected to live in cities, according to Quartz. The Hunt Library, located on NC State University’s Centennial Campus, is one of eight structures around the world highlighted by the project. Featuring a bookBot, five stories and over 230,000 square feet, Hunt Library is often called the “Library of the Future,” with an exterior architecture modeled on the area’s textile industry past. For the 2050 Project, King’s team, which includes CISLM Innovation Project Manager Alexis Barnes, also created a 3D model of England’s Hope Gardens, a temporary housing facility built from shipping containers. King also serves as the chief innovation officer of the MJ-school’s Reese News Lab. A former editor of innovations and director of video at The Washington Post, King has worked not only with media outlets, but with U.S. and foreign governments, using innovative technologies to address issues ranging from disease prevention to war violence. Read more about the 2050 Project here. Read more about Hunt Library here.